April 23, 2019 (KHARTOUM) - The U.S. Deputy Assistant Secretary (DAS) for East Africa and The Sudans called n the leader of the transitional military council (TMC) to negotiate with the opposition groups on the formation of a civil government. Makila James who is visiting Sudan nowadays met Tuesday with Abdek Fattah al-Burhan TMC leader to discuss the political situation in the country after the fall of the regime of President Omer al-Bashir. In a statement released on Tuesday evening, the U.S Embassy in Khartoum said the visiting diplomat commended the TMC on their decision to heed the people of Sudan’s legitimate demand for a civilian-led, inclusive and representative government that respects human rights. "She, also, encouraged the TMC to continue to negotiate with the political opposition and protest leaders and to form a civilian-led transitional government," reads the statement. The opposition which suspended discussions with the TMC political committee organized significant protests across the country on Tuesday and has proven its capacity to mobilize the Sudanese street. Another protest is scheduled for Thursday before to announce civil authority, a lean government and the appointed transitional legislative assembly. The visiting diplomat, also, held a meeting with the Freedom and Change forces. "She commended the people of Sudan for their resiliency and commitment to non-violence as they expressed their legitimate demand for inclusive and representative government," said the Embassy. Further James reiterated the U.S. priority to see a civilian-led transition to a peaceful and democratic Sudan, stressed the statement. JOHANNESBURG – Former President Thabo Mbeki says while the African Union and the international community discuss the future of Sudan, the country’s sovereignty must be respected. Mbeki visited the African National Congress (ANC) pavilion at the Rand Easter Show where he weighed in on the ongoing Au Troika Summit in Egypt being attended by President Cyril Ramaphosa. At the summit, African leaders will focus on “the evolution of the situation in Sudan” where protests continue after the military toppled President Omar al-Bashir. Egyptian President Abdel Fattah al-Sisi is also the current president of the African Union. He will receive the Chadian president Idriss Deby, Rwanda’s head of state Paul Kagame, Congo’s Denis Sassou-Nguesso, Somalia’s Mohamed Abdullahi Mohamed and Ramaphosa as well as Dijbouti’s leader Ismail Omar Guelleh. For Sudan, the objective “is to discuss … the most appropriate ways to address the evolution of the situation and to contribute to stability and peace”, Egypt’s presidency said. The AU on 15 April threatened to suspend Sudan if the military does not hand over power within 15 days of that date to a civilian authority. Ambassador Menkerios will make his remarks to ‘Building Democracy in Eritrea’, a two-day conference held at Senate House, University of London, from 24-25 April. The landmark conference will hear from Ambassador Menkerios that only the formation of a new national body of representatives “can prevent violence” following the end of the current dictatorship. President Isaias Afwerki has ruled Eritrea since independence in 1993. He has suppressed all opposition parties, crushed the independent media and imprisoned his opponents indefinitely. Eritrea has “the notoriety of being perhaps the only country in Africa that does not have a functioning constitution, a legitimate elected government, nor legitimate and functioning governance institutions that ensure accountability,” Ambassador Menkerios will say. The two-day conference is being organised by Eritrea Focus, in partnership with the Institute of Commonwealth Studies at the School of Advanced Study. It brings together more than 70 delegates from the USA, Europe and Africa, including academics, campaigners, members of the Eritrean diaspora, and international experts. The London conference meets as the Sudanese and Algerian uprisings are unfolding, and which serve as examples of how regime change can come about. The aim of the conference is to look beyond Eritrea’s current dictatorship and to explore how democratic renewal can be assisted and encouraged. Prominent humanitarians working with the US Congress, the European Union and the British Parliament. While the rapprochement between Eritrea and Ethiopia last year brought an end to the state of “no war, no peace” that persisted for 20 years, there are no signs that any reforms have been enacted to address the drastic situation of human rights within the country, which last month the UK Government said remained of “significant concern”. Eritrea Focus is an association of Non-Governmental Organisations (NGOs), human rights organisations, exile and refugee groups and individuals concerned with the gross abuses of human rights in Eritrea. The objective of Eritrea Focus is to draw attention to the horrific abuses and suffering of Eritreans, both within the country and as refugees living abroad. We campaign for democratic accountability in Eritrea and the establishment of the rule of law, and actively engage with the international community in our efforts to achieve this. Eritrea Focus provides secretarial support to the All-Party Parliamentary Group (APPG) on Eritrea. 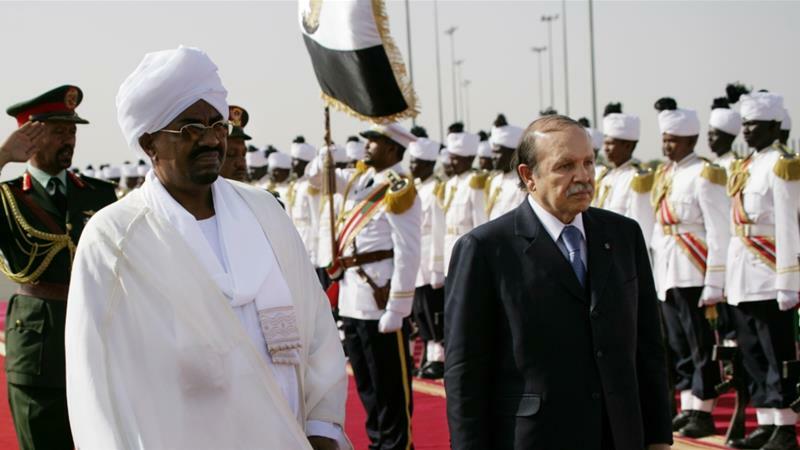 April 20, 2019 (KHARTOUM) - Sudan’s public prosecutor’s office opened two complaints against the deposed President Omer al-Bashir on charges of money laundering and possession of large sums of hard currency without legal ground, a judicial source told Reuters on Saturday. The source added that the senior prosecutor appointed by the military council to fight corruption ordered the arrest of the former president and questioned him soon in preparation for his trial. The prosecution will question the former president who is already imprisoned in Khartoum central prison of Kober, and that there are legal proceedings will be taken against some other figures of the former regime who are accused of corruption. Sudanese media said on Saturday that a team of the armed forces and military intelligence had raided the residence of the ousted president. The Alray Alaam newspaper reported that the team found large amounts of foreign and local currencies which amounted to more than 6 million Euros, 351 thousand U.S. dollars, and 5 billion Sudanese pounds. The newspaper quoted the prosecutor in charge of corruption cases, Mutasim Abdellah Mahmoud, as saying that the prosecution immediately began to implement the directives of the Transitional Military Council, and carries out its duties in the fight against corruption. Mahmoud said further search operation will be at al-Bashir’s residence, and the seized money will be deposited in the Central Bank. The military council said they refuse to hand over the former president to the International Criminal court and pledged to try him for Darfur war crimes in Sudan. Summary: Ending the “state of war” between Ethiopia and Eritrea has changed very little. The exodus from Eritrea continues, but they are not reaching Europe. Just 492 people arrived in Italy via the Central Mediterranean route, which is the route most frequently used by refugees and migrants from the Horn of Africa. It was with much anticipation – following an announcement in June 2018 that Eritrea and Ethiopia had agreed to end the two-decade long “state of war” between the two countries and resume friendly relations, including the reopening of border points – that the humanitarian community expected to see a change in cross-border displacement dynamics. Forced military conscription, often justified by the Eritrean government as a necessary defence measure during the hostilities, remains one of the primary drivers of migration for both Eritrean children and adults. To date, the Eritrean government has not made any changes to the duration of national conscription and it remains as service for an indefinite period. Renewed concerns have emerged surrounding reports that the EU is backing a road-building project that will use National Service conscripts, who critics argue are “forced labour” and are recruited for an indefinite period. The EU has stated that it will increase the pay rates of the national service recruits while still upholding their human rights. While UNHCR projects that the Eritrean refugee caseload in Ethiopia will go down to 123,841 by the end of 2019 (from 173,879 at the end of 2018), figures in the final quarter of 2018 suggest that the opening of borders between the two countries actually resulted in an influx of Eritreans crossing over into Ethiopia with UNHCR approximating that the average daily rates of arrivals was 180 individuals – up from 50. By the end of 2018, there were over 1,700 refugees registered at Endabaguna Reception Center awaiting transfer to the camps with an average daily rate of 390 individuals across all camps in Ethiopia. Family reunification was cited highly as one of the reasons for the influx, and anecdotal reports suggest that the high levels of arrivals have continued into the first quarter of this year. Furthermore, interviews conducted with Eritrean refugees in refugee camps in northern Ethiopia indicate that a sizeable number of Eritrean youth arriving into Ethiopia opt to pursue onward movements from the camps to urban centres within, as well as outside of Ethiopia. In fact research indicates that the number of Eritreans crossing into Sudan has not reduced. This is likely due to various reasons: the driving factors for migration for many Eritreans (forced conscription, political oppression) still remain; many Eritreans remain sceptical of the political changes between Ethiopia and Eritrea which some feel have not been transparent especially with rumours of security crackdowns in border towns; and the deterioration of living standards for many refugees living in over-populated camps in Tigray State. Additionally, Sudan’s smuggling networks still remain operational and flexible allowing them to adapt to broader regional shifts including closure of old routes thereby making it easier for migrants to cross through. The Government of Ethiopia continues to advance its ‘Out of Camp’ policy under the Comprehensive Refugee Response Framework which will seek to provide work permits to refugees, increase their enrolment in schools, provide access to irrigable land, facilitate local integration, earmark jobs in industrial parks for refugees and provide access to documentation to facilitate access to essential social services. In addition to the continuation of factors that drive people out of Eritrea, this could be a pull factor for Eritreans to come to Ethiopia once rolled out. Meanwhile, government representatives from both countries held high level meetings in January 2019 to discuss the regularisation of trade and transport relations between the two States. According to UNHCR, the total number of arrivals in Europe between January and March 2019 was 12,408 persons. Reports show that the number of irregular entries into the EU are at the lowest level in five years. Just 492 people arrived in Italy via the Central Mediterranean route, which is the route most frequently used by refugees and migrants from the Horn of Africa. While a subdued level of movement is typical during the first quarter due to adverse weather conditions, this represents a significant drop in number of arrivals into Italy from 5,945 over the same period in 2018. Refugees and migrants from the Horn of Africa accounted for just 44 of the arrivals into Italy in the first quarter of 2019, representing less than 9 percent – a large difference from numbers at the peak of European sea arrivals in 2016, with more than 40,000 arrivals from the Horn of Africa. As data shows that refugees and migrants from the region are still moving northwards towards Europe, this may suggest that increasing numbers are stranded along the way. As at the end of March 2019, there were 8,728 Eritrean, 3,680 Somali, 1,252 Ethiopian and 156 South Sudanese refugees and asylum seekers in Libya. Measures by EU-supported Libyan coastguards to intercept and return boats departing from the Libyan coast and efforts to repatriate irregular migrants continued, possibly also contributing to the reduction in arrival figures in Europe. Prime Minster Abiy Ahmed has appointed Gedu Andargachew and Lemma Megersa as Ministers of the Ministry of Foreign Affairs and The Ministry of Defense respectively. The House of People’s Representatives (HPR), in its ordinary 34th session today, has ratified the appointment with majority vote. Former Defense Minister, Aisha Muhammed, is also appointed as Minister of the Ministry of Urban Development and Construction. Gedu Andargachew was President of the Amhara Regional State before his replacement lately by the Regional Council by Ambachew Mekonnnen. Lemma Megersa is President of Oromia Region and is expected to be replaced by another Central Committee member of the Oromo Democratic Party soon. 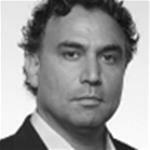 It may still be too early to judge, but so far it looks like these latecomers have learned important lessons from Arab as well as other revolutions. In fact, Sudan and Algeria may well be able to deter the counter-revolution and avert the dangers of civil war. As the new Sudanese Freedom and Change alliance, a public committee representing the demands of the protesters, proposes, a four-year period may be suitable to stabilise the country politically and economically and chart a new way forward. So far developments in Sudan and Algeria have gone in the right direction, but there is also a lot that can still go wrong, considering the road to democracy is full of traps and pitfalls. The growing popular call of ‘’ ይኣክል! كفى! -- Enough is Enough ‘’ to the cruelties of the Asmara regime by waves of Eritreans at home and abroad is a real threat – probably the final blow – to Isaias Afeworki’s several decades old dictatorship. And when the threat is real, Isaias Afeworki always uses religion and external enemies as his most trusted and so far effective weapons to fight back. Dictator Isaias did this in a subtle manner throughout his political life extending to a half century. Recent examples are how he and his clique distorted and manipulated the 2013 incident of an Eritrean army unit led by Wedi Ali and that of a private Islamic school of the great patriot, nonagenarian Haji Mussa, in 2017. May their souls rest in peace. To again try to use that weapon, the one-man dictatorship’s Ministry of misinformation released on 3 April 2019 yet another official lie. The released statement aimed to win back regime’s former gullible listeners by trying to tell them that Eritrean Muslims and their co-religionists in the region are their enemies. What a shame, and what a shameless regime!! The Eritrean dictator is not a religious person. He has no religion. Yet, he until this year knew how to play around religions in order to survive and stay in power. But why now mention a non-existing Eritrean Muslim League in connection with the formation of a civic organization of Arabic speaking Eritrean intellectuals who have all the right to form such an association? In simpler terms, the evil regime in Asmara wanted to invoke the word ‘’Rabita’’ – an innocent Arabic word that means ‘league’ or association – in a desperate attempt to create new a bogyman, a new enemy at a time when Ethiopia and its ‘Woyane’’ are no more enemies. Only to stress, it is quite clear to the majority of Eritreans today that the PFDJ statement wanted to appeal to the erroneous and distorted perception built long ago around the Arabic phrase ‘Rabita Islamia’ for the Eritrean Muslim League of the 1940s which, to many elements opposed to Eritrean nationhood at that time, was an organization of ‘traitors’ allied with enemies of ‘‘Christian Eritrea and Ethiopia.’’ But will that Isaias -- that old master of deception -- succeed to use religion also this time round? Measuring by the political climate building around the call for ‘’Enough is Enough’’, one can assume that the vast majority of Eritreans today are of the belief that he will not succeed. For the sake of the new Eritrean generation, one should repeat affirming the truth that ‘Rabita Islamia’ or the Eritrean Muslim League of the 1940s was not a negative force, as the dictator in Asmara and his fast dwindling clique repeated and in different forms wanted to mislead people. The Eritrean Muslim League was a great patriotic organization that can claim a lion’s share in the history of the slow and costly growth of Eritrean national awareness. It was around the love for a national Eritrean flag, a National Assembly, an Eritrean constitution with democratic rights, among others, that Eritrean nationhood was built. The great patriots of the day, on top of them Woldeab Woldemariam and Ras Tessema Asberom, were the closest friends of the Eritrean Muslim League and its energetic nationalist leader, Ibrahim Sultan Ali. ‘’… by his own admission, Ibrahim Sultan had to name his party after Islam ("al RabiTa al Islamia"), not because of his religious belief but because he and his group of militants found it the only easy and feasible way of rallying the majority of the Eritrean Moslems for independence [at a time when Ethiopia was winning their compatriots through religious appeal]. Al RabiTa al Islamia was not a party of religious fanatics as detractors insinuated. To my knowledge, Eritrean Moslems have never been fanatics, and in general, never deserved that epithet [to be called fanatics]…… In recent years, when political Islam mobilized masses for fundamentalist wars elsewhere, Eritrean Moslems continued to give deaf ears to any call for Jihad, a stillborn movement in our country, whose nominal existence was aided and abetted by the actions and omissions of the regime in Asmara. ’If I were not aware of our own situation, I would have described the grisly mass murders in Somalia, Rwanda, former Yugoslavia and Liberia as barbaric crimes perpetrated by backward peoples. I would have said 'we are different, we are not like them'. But what we had gone through in Eritrea was not different from what is going on in other countries. We in Eritrea suffered mass murders, one ethnic and geographic group cleansing the other in a cowardly and inordinate manner. We have now come a long way from that past, and the present and future generations [in Eritrea] who had not seen what we did would be surprised of what is going on in Somalia, Yugoslavia, Rwanda and Liberia. The surprise comes because they did not know what had happened in our country. Seen from this angle, it would appear that the present and future generations would benefit from knowing about it. But unless done in a constructive way, making the new generation aware of a black spot in its history is a bit difficult’. To conclude, this quick writing and the excerpts from a lengthy old article cannot fully depict how much the current dictator in Eritrea has been working hard to divide Eritreans on religious and other bases. However, the time has come that he will not make it. At least I believe so. 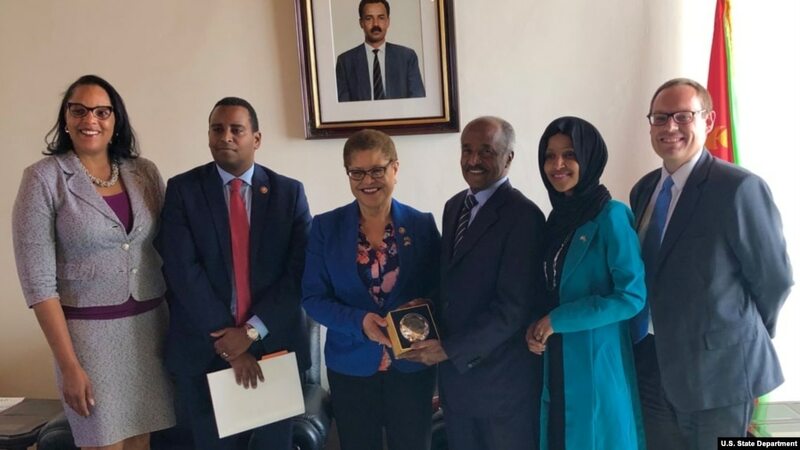 Chief of Mission Natalie E. Brown, far left, and Deputy Chief of Mission Stephen Bank, far right, pose with Rep. Joe Neguse, Rep. Karen Bass, Eritrean Minister of Foreign Affairs Osman Saleh and Rep. Ilhan Omar. The members of Congress were on an official visit to Eritrea. Ciham Ali Abdu was born in Los Angeles and grew up in Eritrea. In December 2012, Eritrean officials apprehended Ciham when she attempted to leave the country without a mandatory exit visa. Her family hasn’t seen or heard from her since, despite attempts to learn about her whereabouts and well-being. U.S. Rep. Karen Bass, who chairs the House Foreign Affairs Subcommittee on Africa, Global Health, Global Human Rights and International Organizations, called for Ciham’s release in social media posts Friday. Bass visited Eritrea and Ethiopia with Reps. Joe Neguse and Ilhan Omar, both of whom joined Congress in January. Neguse represents Colorado’s second district. His parents emigrated from Eritrea to the U.S. in 1980. Omar, a Somali-American, came to the U.S. as a refugee in 1992 and represents Minnesota’s fifth district. It was the first congressional delegation to visit Eritrea in 14 years, according to the U.S. Embassy in Asmara. 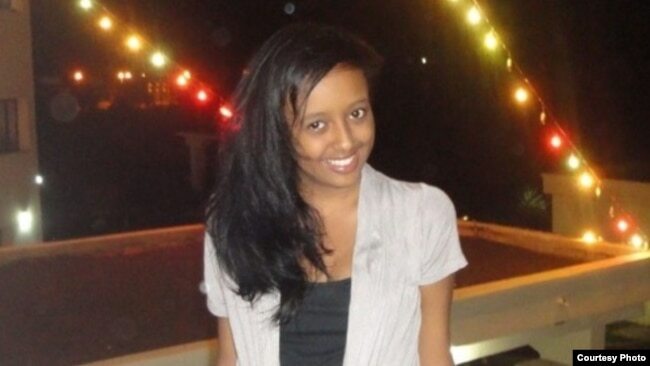 The Eritrean government refuses to acknowledge Ciham’s citizenship, or even her existence. Bass, who represents California’s 37th District, near where Ciham was born, is the highest-ranking U.S. official to put a spotlight on her case. The U.S. State Department hasn’t officially confirmed Ciham’s imprisonment, saying only that the U.S. government is aware of reports about Ciham’s detainment. Bass told reporters in Addis Ababa, Ethiopia, last month that she had just recently learned about Ciham’s case, according to the Associated Press. Human rights groups have for years called for the 22-year-old’s release. At a town hall meeting Saturday in Los Angeles, Bass said she was committed to working with both the Eritrean and Ethiopian governments, along with the U.S. Embassy in Asmara, to secure Ciham’s freedom. 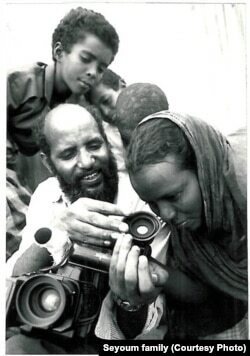 Seyoum Tsehaye, 66, was a war photographer during Eritrea’s 30-year struggle for independence. He later held various positions, including head of the state-run television station Eri-TV. Vanessa Tsehaye founded One Day Seyoum, an organization focused on securing the release of her uncle, Seyoum Tsehaye, an Eritrean journalist who has been imprisoned since 2001. Tsehaye spoke to VOA Wednesday, on Ciham’s birthday. The United Nations, Amnesty International and other rights groups have accused the Eritrean government of human rights violations designed to suppress dissent, including arbitrary detentions, forced disappearances and torture. The government has denied those claims and criticized the U.S. and U.N. for seeking to undermine its sovereignty. VOA’s attempts to reach the Eritrean embassies in London and Washington went unanswered. After fighting a 30-year war for independence from Ethiopia, Eritrea gained international recognition in 1993. The country has not held a national election nor ratified its constitution since then, but recent peace overtures with Ethiopia, Djibouti and Somalia have raised hopes for reform and justice for detainees like Ciham.